Arbitrary destruction of reputations turns people into slaves. Ever been taken down by an “ambush audit”? It’s not fun. Is your organization actually built around approaching businesses and cold-pitching them, with the “ambush audit” as the mainstay of your approach to winning new business? Well then. You are the embodiment of evil. At HeroConf in Portland, I had the pleasure of sitting down to dinner with my good friend, a whip-smart and creative PPC agency owner. (We’ll call him “Steve.”) Judging by the quality of his presentations and the character of his personal dealings, I’m pretty sure his group is doing a great job for clients. They don’t want to take over the world: just improve their part of it. Talk turned to PPC campaign audits that are slanted so unfairly that they cause a panicked client to dump their perfectly good agency and take up with rogue players. Steve could barely speak to the topic; he just shook his head with a combination of sadness and repressed rage. It’s as if basic interpersonal and business ethics are lacking in some agencies that do PPC and SEO. Go figure! We agreed to carry on in our quaint way, conducting ourselves using more or less the Golden Rule, in our own approaches to new business development. 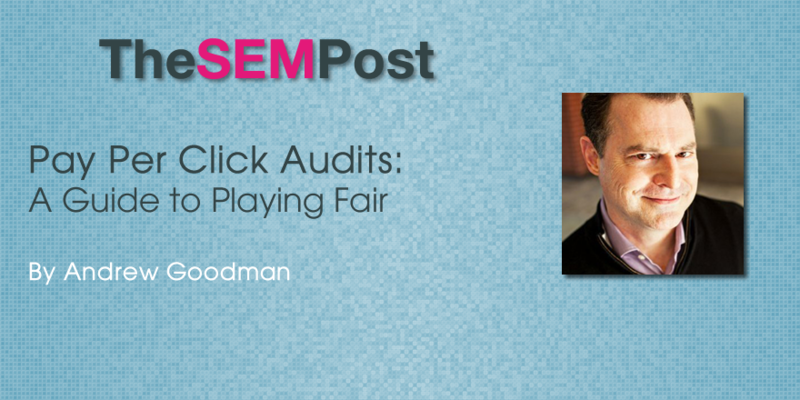 So what’s fair and not-so-fair when it comes to PPC Audit talking points? I decided to put together a few examples to illustrate. Here are some account mistakes that are fair game for audit critique. If an audit turns up these faux-pas, take them seriously. Weird and disproportionate levels of effort. Many PPC managers – but especially underconfident ones – prefer the kind of client relationship where effort level is rewarded regardless of logic or priorities. Busy-beaver work is a mainstay of any good PPC agency’s work, of course. Top agencies outwork just about anyone around, particularly on larger accounts, because that’s the nature of the PPC beast – it requires detailed optimization and widespread testing. But for a practitioner who has no clue, this morphs into a “reasonable facsimile of account management” – deep dives into unnecessary busywork that don’t significantly address the performance of the account as a whole. Examples might include regional campaign work where it makes little difference to the overall outcome, and pernicious keyword adds to the tune of dozens or hundreds of superfluous or even harmful keywords being tacked onto each and every ad group in a campaign. Contrasted with no effort in the areas that matter, unfocused “high visibility output” is a recipe for weak account performance. Weird and wacky bidding patterns. Automation can be extremely helpful. Unfortunately, I’ve run across accounts that are being wrecked by proprietary (first-party) autobidding tools whose bugginess and rudimentary nature resemble early betas of not-so-good tools that were coming on the scene a decade ago. Along with automation, we need a heavy dose of common sense. Has the average CPC on an account just drifted up and up in recent months because a simple rule set allowed long-tail (perfectly good) keywords to be slowly bid down towards $.01, and so-so, broader match keywords to grab an increasing impression share due to their “acceptable” ROI? Accounts get screwed up by any one-sided view of bidding (always up, always down), but they really, really, get screwed up when the mediocre performers are bid up as a shortcut, and the low-frequency but high-value words are bid down out of boredom or incompetence in statistical analysis. Failure to implement key features that any real PPC professional would insist on. Sure, we may all be guilty of neglecting to add enough negatives to some parts of a campaign, or failing to insert a mobile-only ad version here or there; sometimes it takes us awhile to review the remarketing strategy; sometimes we don’t get the exact right bid for the mobile channel. But if there are features and tactics that have been neglected so completely that it is obvious the practitioner was simply unaware of their existence, that’s a red flag that you have a non-professional working on your account, isolated from mainstream practices, operating in the dark. Broad match all over the place, with no attempt to ameliorate the situation. Accounts get handed off from one person to another sometimes, and of course, keyword tools leave broad match as the default. But at some point, an account with a large number of broad match keywords should have been shored up with an appropriate level of exact matches and broad match modifiers. At least some strong push in that direction should be evident. It’s not fair to nitpick, but it is absolutely fair to call it negligence where there is an apparent absence of grasp of match types. But here are some disingenuous, picky, tricky, faux-thorough audit talking points that you should probably take with a grain of salt. Unproven claims about ad creative, creative testing methodology, etc. Look, I’ve talked myself hoarse as an advocate of advanced ad creative testing methodologies. Tests should be ongoing in an account, and they should be “driving towards” a set of go-to ad components that are most likely to win across the board. Individual adgroups should also get attention. But I’ve noticed that even when the ad testing approach is sound and good, the nitpicking style of audit will claim it isn’t. I’ve also had the opportunity to watch what transpires after a nitpick audit turns into a full gig: the new agency doesn’t follow through on the impossibly perfect/gargantuan/prescient effort they claimed should be happening in the account. Even worse, they may attempt to imprint their theories recklessly on the account, leaving the account running with tens of thousands of new ads with no Quality Score or performance history. That’s even worse if they pause or remove the ads that are already running. Unproven claims about account structure. Account structure is certainly important, but is no magic bullet. Rebuild a whole account using an impressive-looking nomenclature? Account rebuilds may be necessary, but if that’s all the firm auditing the current PPC effort has to say, then they don’t have much to say. Moving things around isn’t the same as driving performance. Over-claiming the financial benefits of marginal tactics. Negative keywords are a staple of PPC management, but overreliance on such tactics to drive ROI is a fantasy at best, or evidence of incorrect fundamentals in adgroup buildout at worst. Vague claims about growth and how the current account management “just isn’t aggressive enough.” One large firm allowed Google to take over their account management after Google showed them a deck promising good results from tripling spend, and the agency was only able to double it. True story. Bad ROI. Along with my friend Steve, I don’t think new business is important enough to be worth winning at any cost. When a prospect reviews one of my audits, I want them to take the marginal parts with a grain of salt. That being said, when I see poor account management and major opportunities being missed, I think it’s fair to call it out. I hope the above was helpful in illustrating the difference between the “unfair nitpick” and “serious” PPC audit talking points. I’m sure you can think of your own examples, and I would love to hear them!